Maj. Paul R. Syverson III, 32, was assigned as the assistant operations officer for the 5th Special Forces Group (Airborne) at Fort Campbell, Ky. He was killed in Iraq on June 16, 2004, during a rocket attack on Logistical Support Area Anaconda, Balad, Iraq. The rocket landed near a group of Soldiers outside of the Post Exchange. 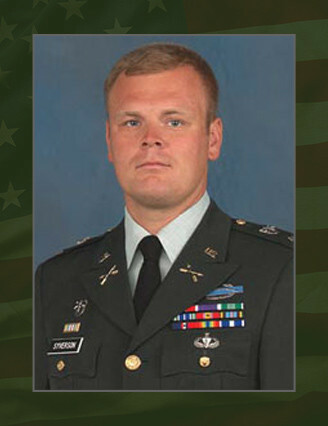 Syverson was a native of Arlington Heights, Ill., and entered the Army in 1993 following graduation from the Virginia Military Institute, where he earned a bachelor’s degree in international relations. His first assignment was with the 3rd Battalion, 41st Field Artillery, Fort Stewart, Ga. In 1998, he graduated from the Special Forces Qualification Course and was assigned to the 5th SFG. While assigned to the 5th SFG, he served in a variety of positions including: Operational Detachment-A commander, battalion staff officer and Group assistant operations officer. He also served as the commander of Headquarters Support Company, 3rd Battalion, 5th SFG. Syverson’s military education and schools include the Field Artillery Officer Basic Course, Joint Deployment Officer Course, Infantry Officer Advanced Course, Special Forces Qualification Course, Combined Arms and Services Staff School, Jumpmaster Course and Pathfinder Course. Syverson’s awards and decorations include the Bronze Star Medal, Purple Heart, Army Commendation Medal, Army Achievement Medal, Joint Meritorious Unit Award, National Defense Service Medal, Armed Forces Expeditionary Medal, Kosovo Campaign Medal, Global War on Terrorism Expeditionary Medal, Global War on Terrorism Service Medal, Army Service Ribbon, Combat Infantry Badge, Expert Infantry Badge, Senior Parachutist Badge, Pathfinder Badge and Special Forces Tab. Syverson is survived by his wife, Jackie, a son, Paul, and a daughter, Amy Elizabeth.